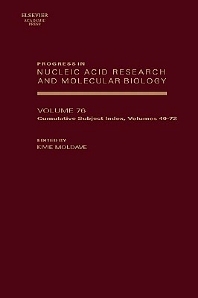 Cumulative subject index for volumes 40-72 of Progress in Nucleic Acid Research and Molecular Biology. Brings to light the most recent advances in these overlapping disciplines with a timely compilation of reviews comprising each volume. Researchers in biochemistry, molecular biology, genetics and cell biology. Department of Molecular Biology and Biochemistry, University of California, Irvine, California, U.S.A.